Reliance Communication is the only service provider which had made no competitive offer against Reliance Jio’s onslaught. But if you talk today, RCom is taking the competition seriously now and launching new plans every alternate day. RCom has now launched 2 new Plan for its prepaid customers across the country, the Plan 147 & Plan 349. 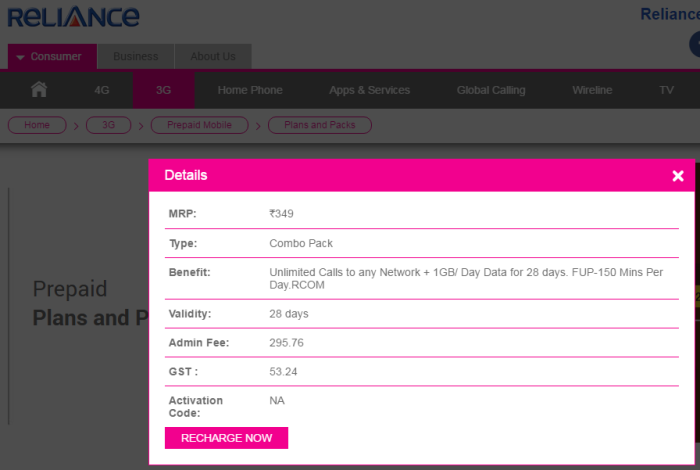 Starting with Plan 147, Reliance (RCom) is offering 1GB data per day for 28 days for Rs. 147. Depending upon the circle, Reliance 147 offers either 2G/4G data or 3G/4G data but 1 GB daily limit remains the same irrespective of the circle. Similarly, Reliance Plan 349 is offering Unlimited Local & STD calls to any network in India along with 1 GB data per day for 28 days. Under Reliance 349 Plan there is a Fair Usage Policy for calls of 150 mins daily. The validity of this plan is 28 days. Reliance has earlier launched similar offers starting with Reliance 555 Plan and then it launched Reliance 193 Plan which was recently revised as well. You can check all the Unlimited Plans launched by Reliance (RCom) on this link.